West Ham look to be picking form of late after accumulating four points from their last two games including a 0-0 draw at home to Chelsea in their last game. The four points are the only ones that the Hammers have managed this season. For United, the 0-0 draw at home to Wolves in the last game sums up the kind of start the record league winners have endured this season. They have already lost two of their first six games, something that should clearly displease the United faithful. West Ham forward Marko Arnautovic could return from the knee injury which ruled him out last weekend. Midfielder Carlos Sanchez picked up a knock in the 8-0 League Cup win over Macclesfield Town and will face a fitness test. Manchester United manager Jose Mourinho is likely to make sweeping changes after Tuesday’s penalty shoot-out defeat to Derby County. Forward Marcus Rashford returns from a three-match ban, while Marcos Rojo is the only long-term absentee. Goalkeeper Sergio Romero is suspended after his red card in midweek, with Lee Grant likely to take his place on the bench. West Ham’s solitary victory in 19 Premier League games against Manchester United came in May 2016 in their last game at Upton Park (D5, L13). The Hammers have failed to score in their last three league matches against United. Life under Unai Emery finally looks enjoyable after the manager has masterminded six consecutive victories after losing both his first two games and the visit of Watford can easily be looked at as a chance to win a seventh on the trot. However, the visitors have started their league campaign on a high, currently sitting in the top four after winning four and drawing one of their first six games. Arsenal o into Saturday’s game having won eight of the 10 Premier League meetings with Watford. However, the Hornet’s two wins have come in the last three matches. Watford have also won on two of their past four visits to the Emirates in all competitions. There has been only one draw in 22 top-flight fixtures between the sides: 1-1 at Highbury 34 years ago. Arsenal defender Sokratis is set to continue his run of starting every league match this season after recovering from a dead leg. Emile Smith Rowe sustained a hip injury during his first start in the midweek League Cup win over Brentford and will be assessed. Watford defender Daryl Janmaat is out for six weeks following knee surgery. Christian Kabasele is available after his red card in the League Cup defeat to Tottenham was rescinded on appeal. Troy Deeney will have injections in a bid to play after suffering ankle ligament damage in the draw with Fulham. Everton’s £27m summer signing Yerry Mina, who is yet to make his debut, is out after suffering a setback in his recovery from a foot injury. Phil Jagielka has returned to training following a knee problem but Seamus Coleman and Andre Gomes remain out. Fulham will assess the fitness of Alfie Mawson, who has a back problem, and Tom Cairney, who is back in training after an ankle injury. Fit-again defender Tim Ream could play his first league game of the season. Fulham have never won a league match at Goodison Park, losing the last 21 fixtures (D4, L22). Everton’s 21 successive home victories is a top-flight record for any side against the same opponent. Tottenham won both of their Premier League games against Huddersfield last season, scoring a total of six unanswered goals. Spurs are unbeaten in their last seven league and cup games against the Terriers (W4, D3). Huddersfield have not beaten Tottenham since the 1955-56 season, when they won both meetings – 2-1 away on 21 April 1956 and 1-0 at home in December 1955. Huddersfield midfielders Ramadan Sobhi and Danny Williams are both still unavailable because of knee injuries. Tottenham playmaker Christian Eriksen is ruled out of Saturday’s game with an abdominal problem. Paulo Gazzaniga will again start in goal, as fellow keepers Hugo Lloris and Michel Vorm are still injured. Full-back Serge Aurier is doubtful with a muscle problem, while fit-again midfielder Dele Alli could start his first league game for four weeks. A week away from their mouth-watering duel with Liverpool, Manchester City could strike a decisive psychological blow by ensuring they arrive at Anfield above Jurgen Klopp’s side in the table. If the champions beat Brighton, then only a win for the Reds at Stamford Bridge will prevent that occurrence – and with events in west London commencing once this match has concluded, there’s even greater incentive for City to ensure there are no unexpected slip ups. The Seagulls arrive at the Etihad with just two wins since early March but it’s ironic that both of them have been against Manchester United, the only league opponents City have succumbed to in their last 21 league matches. Manchester City look set to rotate their squad ahead of the Champions League next week, with Riyad Mahrez in line to start after scoring twice as a substitute against Cardiff. Kevin de Bruyne, Benjamin Mendy, Eliaquim Mangala and Claudio Bravo are all still injured. Brighton pair Pascal Gross and Dale Stephens are out with respective ankle and hamstring problems. Jose Izquierdo stepped up his fitness by playing an Under-23 game on Monday. Summer signing Florin Andone awaits his debut, having been on the bench last weekend on his return from a groin injury. Manchester City completed a Premier League double over Brighton last season, including a 3-1 win in May’s corresponding fixture which was City’s final home league game of 2017-18. Brighton have never won at Manchester City in eight previous attempts (D2, L6). The Seagulls’ last league win over City was a 2-1 home victory in the second tier in April 1989. Newcastle striker Salomon Rondon is facing a spell on the sidelines after suffering a thigh strain last weekend. Injured French defender Florian Lejeune is the Magpies’ only other certain absentee. Demarai Gray sprained his ankle in Leicester’s midweek Carabao Cup win at Wolves and is likely to be out for up to six weeks. Wes Morgan is available after serving a one-match ban, while £19m signing Caglar Soyuncu awaits his debut. Newcastle’s 2-1 away win over Leicester last April ended a five-match losing streak against the Foxes in all competitions. Leicester can earn three straight wins at Newcastle for the first time since the 1960s. Wolves could equal the Premier League record by naming an unchanged starting line-up for the seventh consecutive match from the beginning of a season. Ivan Cavaleiro is available after making his comeback from a back injury in Tuesday’s League Cup exit. Southampton welcome back leading scorer Danny Ings, who was ineligible to face parent club Liverpool last weekend. Moi Elyounoussi and Manolo Gabbiadini should return but Shane Long is likely to miss out with a toe problem. Southampton have gone five matches without victory against Wolves in all competitions, losing the last three. They have never suffered four defeats in a row in this fixture. However, Wolves are winless in eight top-flight meetings, losing both previous Premier League encounters in 2003-04, since a 3-0 victory at The Dell in April 1980. Wolves won at home to Southampton for the first time in 10 attempts in the most recent meeting at Molineux, a Championship game in April 2009. Liverpool will be hoping to continue their excellent start to the Premier League season when they travel to Stamford Bridge for a date with Chelsea. Jurgen Klopp’s men have won all their first six games of the new campaign and currently sit two points on top of the summit. However, they are coming up against a side that eliminated them from the League cup on Wednesday. The victory three days ago should motivate a Chelsea side that drew 0-0 at West Ham United in their last league game. Chelsea will monitor the fitness of Antonio Rudiger, who suffered a groin injury at West Ham on Sunday. Pedro and Ruben Loftus-Cheek could be available after injuries, while Andreas Christensen has overcome a stomach bug. Liverpool’s Virgil van Dijk has not trained since being substituted with a rib injury last weekend but he hasn’t been ruled out of Saturday’s game. Trent Alexander-Arnold and Georginio Wijnaldum have recovered from illness and injury respectively. 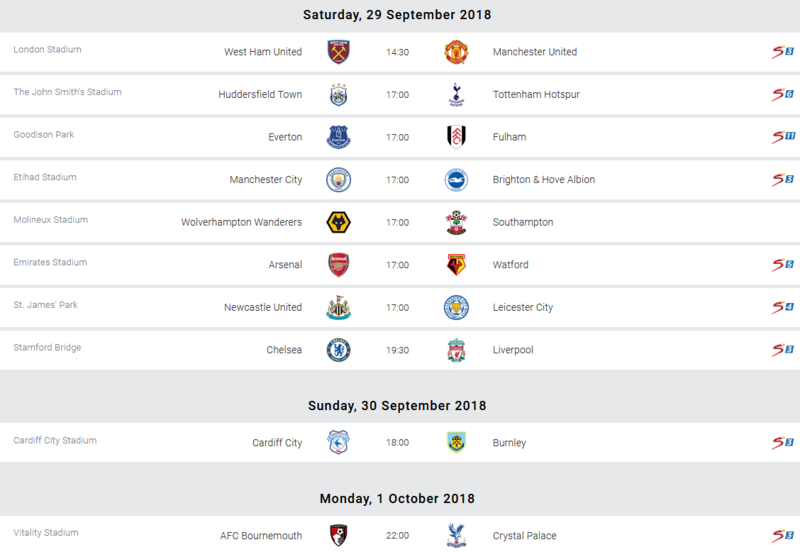 This is the most-played fixture in English football in the 21st century, with Chelsea and Liverpool facing each other on Saturday for the 58th time in that period. Liverpool have won only two of the past 15 meetings in all competitions (D7, L6). Both victories came at Stamford Bridge. Liverpool’s run of 14 league games without a clean sheet against Chelsea is their longest against a single opponent in the top flight since a 17-match streak against Blackburn between 1947 and 1995. Lee Peltier starts a lengthy spell on the sidelines as Cardiff host Burnley in the Premier League on Sunday. The defender is facing two to three months out after dislocating a shoulder against Manchester City last weekend, but the defender will not require an operation as the injury will heal naturally. Aron Gunnarsson (knee) remains out, but Sol Bamba is expected to return in defence with Bruno Ecuele Manga moving to right back in Peltier’s absence. Burnley are likely to be without Robbie Brady as he continues to build up his fitness while Ben Gibson remains out (hernia). Nick Pope is the only other long-term absentee as he continues to recover from a dislocated shoulder. This will be the first top-flight meeting between Cardiff City and Burnley since March 1962 when the two sides played out a 1-1 draw. Cardiff are unbeaten in 13 matches in all competitions against Burnley (W4 D9), since a 0-2 loss at Turf Moor in April 2007. Burnley haven’t won away from home against Cardiff in any competition since April 2000, going 11 matches without a win (D3 L8). Cardiff are winless in 10 Premier League games (D3 L7), losing the last three in a row by an aggregate score of 3-12. Burnley have never won a Premier League away game against a promoted side before, losing five and drawing six of their 11 such games. Bournemouth will continue to be without Dan Gosling, with the midfielder suffering from a calf injury, while Diego Rico retains his place at left-back with Charlie Daniels not expected to be back in contention from a knee injury until next week. Christian Benteke remains sidelined with a knee injury for Crystal Palace but Connor Wickham is closing in on full fitness following a calf strain. Scott Dann (ACL) and Jairo Riedewald (knee) remain out, but Hodgson has an otherwise full-strength squad. Bournemouth have won just once in six previous Premier League matches against Crystal Palace (W1 D4 L1), winning 2-1 at Selhurst Park in February 2016. Crystal Palace have lost just once in their last five away league games against Bournemouth (W2 D2 L1), this after losing nine of their previous 10 visits there (D1). The away side has opened the scoring in each of the last four Premier League meetings between Bournemouth and Crystal Palace, but have only gone on to win once (D3). Crystal Palace are currently on 99 Premier League wins and could become the 22nd side to reach 100 in the competition.